For the first time in the history of the championships, 2016 will regroup the Junior, Youth and Elite categories under the same roof. During this major tournament, the best boxers across the country will face each other during a week-long competition hoping to become national champion in their respective categories. Each province had the opportunity to register up to 2 male and 2 female boxers per weight division and age group, for a combined total of 237 athletes. The competition will take place from March 28th until April 2nd at the Hilton Québec Hotel (located at 1100, boulevard René-Lévesque Est, Quebec City, QC, G1R 2P3). Two rings will be in place for the championships. The competition for the Junior and Youth divisions will be held in the form of a round-robin tournament while the Elite division will showcase an elimination tournament. 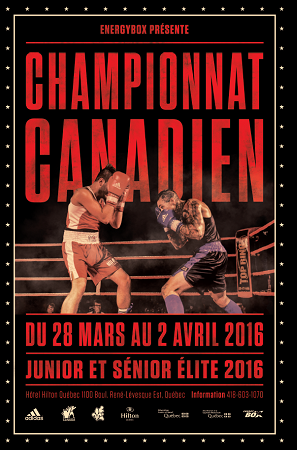 The schedule will be finalized at the opening of the championship on Monday, March 28th. The 2016 Boxing National Championships are organized and held by Club EnergyBox. Admission tickets will be available at the door and live streaming will also be available throughout the championships. Be sure to consult our website and social media platforms (Facebook and Twitter) to stay informed!